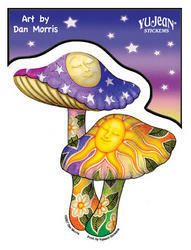 A celestial set of psychedelic mushrooms designed by Dan Morris is the theme of this sticker. This die cut sticker measures approximately 4 1/2" X 5". Great for your car, guitar case, binder, tool box, window, etc.